America’s Independence Day is celebrated across the country with fireworks, hot weather, pool parties, and barbecues. 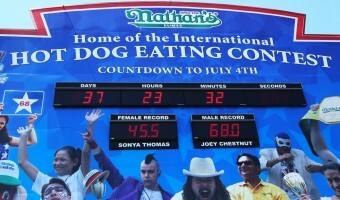 For the thousands that gather on Coney Island in America’s largest metropolitan, New York City, July Fourth is commemorated with another annual tradition – the Nathan’s Hot Dog Eating Contest. Beginning in 1916, the Hot Dog Eating Contest has become the “de facto Olympics” for the sport of competitive eating. How and why did competitive eating become so popular? What is the history behind this glutinous sport? The beginnings of competing chowers can be traced back to a Viking parable. While both Thor and Loki are part of the Marvel universe, blessed with several high-grossing movies, they are, of course, actually Nordic gods (and not brothers). Many tales were told of these two’s travels, but the story that applies here is the one where they pay a visit to the court of the giant king Útgard-Loki (meaning “Loki of the Outyards” and a different Loki than Thor’s pal.) As told in the Prose Edda, a compilation of myths from 13th century Iceland, Thor, Loki, and their other travel companion Thialfi, arrive at the humongous palace of the giant king Utgard-Loki (ironically, after another run-in with a giant by the name of Skrymir). Utgard then challenges each visitor to a competition. Thialfi picks athletics, but loses a foot race to Hugi, which actually means “thought” in Old Norse – and thought is always faster than physical speed. Thor is challenged to three events, failing at each one. One of the events was attempting to drink the contents of a horn anchored into the sea, rendering the task impossible. Loki declares his own competition, by making the proclamation that he could eat faster than anyone. Utgard takes up the challenge and sets him against Logi. Sitting at the opposite sides of the table with a wooden plate full of meat in the middle, they take off chowing. Upon meeting in the middle, Loki has eaten all of his meat, but Logi had not only eaten all the meat, but the bones and the wooden plate as well. Logi is declared the winner and only later did the Nordic gods realize that Logi, meaning “fire” in Old Norse, was the “most voracious of all the elements.” Either way, the mythical match between Loki and Logi was the first record of a competitive eating contest in recorded history. There is little other evidence of such eating competitions in early history. While overindulgence was a past time of the Romans and Middle Age English monarchs, it seems the competitive eating contests we’ve all come to know and love started with the great American tradition of pie-eating. From pies, competitive eating grew to incorporate all sorts of food and participants, including a 1919 spaghetti eating contest between a New York Yankee and an ostrich. But it’s hot dogs that have triggered the modern-day competitive eating craze. There have been several individuals who claimed to be the first to put a hot sausage in a bun. (Bread and sausages having been around for thousands of years, one would think no modern claimant was really the first.) Nevertheless, one of the claimants was German immigrant and Coney Island resident Charles Feltman. By the late 1860s, Coney Island already had become a popular tourist destination, albeit with a bit of a rougher crowd with all of its bathhouses and saloons. Feltman began his salesmen career in 1867 by selling pies out of a wagon. According to the legend, that same year, looking to diversify his wares, he put one of his beloved German frankfurters on a roll to prevent him needing to give customers plates and silverware. (The general theme among all the claimants to this bun idea was pretty much the same, and most were also German immigrants, like Feltman.) It’s said he sold nearly 4,000 of his frankfurters that summer (they wouldn’t be called “hot dogs” until a couple decades later). Whether he truly invented the idea or not, within four years, sausages in a bun would provide Feltman the funds to lease a plot of land on Coney Island that eventually led Mr. Feltman overseeing a small empire with nine restaurants, two bars, a beer garden, a ballroom, a hotel, an outdoor movie theater, a carousel, and a roller coaster. In 1916, one of Feltman’s employees was challenged by two of his co-workers to start his own business. So, Nathan Handwerker did just that. He opened his own hot dog stand at the corner of Surf and Stillwell Avenue. Spiced with his wife Ida’s special garlic recipe, these dogs sold for a nickel (about $1.05 today). Feltman’s dogs were being sold for a dime. Not only that, Nathan had a flair for promotion. For instance, he invited interns from Coney Island Hospital dressed in their white scrubs, to draw attention, (or, as some have speculated, homeless men he paid to dress in white) to eat his dogs for free. That wasn’t the only way Nathan promoted his hot dogs. That same summer of 1916, on July 4th, Nathan decided to hold a contest in the same vein of the sideshows that dotted the island. 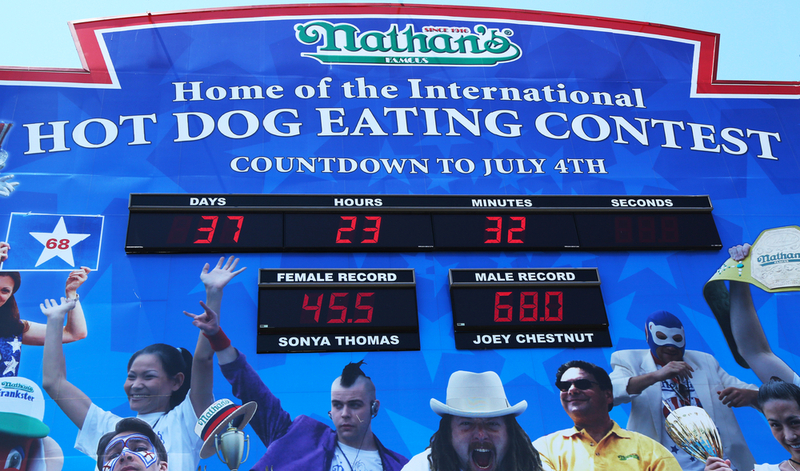 Four tough immigrant men competed in the very first Nathan’s Hot Dog Eating Contest at noon on Independence Day. They were given twelve minutes to eat as many hot dogs and buns as they could. To this day, the format has remained exactly the same. Legend states that Jim Mullin, a Brooklyn construction worker, won the contest by eating ten hot dogs and buns in the twelve minutes. It was said he told Nathan afterwards that he would have been able to eat more if the buns weren’t so stale. Whether that’s perfectly accurate or not, from 1916 to the mid-1990s, Nathan’s Hot Dog Eating Contest went on every year (save for 1944 due to the war) in front of hundreds of spectators. But brothers George and Rich Shea changed all of that. George, the older one, had worked for a public relations firm that had the Nathan’s hot dog account and was in charge of the contest. Through the 80s and 90s, that mostly consisted of gathering a few “heavyset gentlemen” and letting them have at it in front of a hundred or two spectators. In 1997, the Shea brothers created the International Federation of Competitive Eating as little-more than a sideshow or joke. They soon realized there was demand for this sort of thing and expanded beyond hot dogs to fries, crab cakes, asparagus, cheese steaks, buffalo wings, sweet corn, oysters, pepperoni rolls, and so forth. Today, there are eighty to hundred competitions per year overseen by what is now called Major League Eating. And these contests are hardly a joke to the competitors. The Nathan’s Hot Dog Eating Contest hit a critical mass in 2001 thanks to the record-breaking antics of Takeru Kobayashi. Upon arriving on the scene in 2001 from Japan, the only other place in the world that competitive eating is as big as it is in the United States, Kobayashi became the face, or more accurately the mouth, of competitive eating. In his first competition, he doubled the record of twenty five hot dogs by eating fifty. He’s gone on to break his own record three times, not to mention set competitive eating records with food ranging from hamburgers to Twinkies to cow brains. Due to Kobayashi’s feats of gastro strength (not to mention several other competitors like Joey Chestnut and Sonya “The Black Widow” Thomas), the Nathan’s Hot Dog Eating Contest has been broadcasted on ESPN since 2004 and attracts many thousands of people every July Fourth to Coney Island, the supposed birthplace of hot dogs in a bun and competitive eating contests. Kobayashi hasn’t competed in the Nathan’s Hot Dog Eating Contest since 2009 due to a contract dispute with the organizational body, Major League Eating. The MLE requires all competitors to sign a contract that gives the organizational a cut of any endorsement revenue the competitor earns. Kobayashi refused to sign the contract and has since been operating as a rogue competitor barred from all MLE events. In fact, he showed up in 2010 to the hot dog eating contests and was promptly arrested when he tried to bum rush the stage. Joey Chestnut has won seven consecutive Nathan’s Hot Dog Eating Contests, but only had to defeat Kobayashi twice due to his ban. Chestnut did pull the upset over Koboyashi in 2007 and beat him in overtime in 2008. He’s aiming for the record eighth straight title in 2014.